Debbie makes glass art for the garden, beautiful jewelry and much more.... watch for it! Functional art like Lazy Susans, Clocks & Bowls! Anne has gone back to painting again along with glass. Check out her watercolors & Acrylics and mixed media pieces. 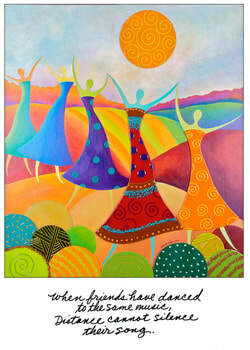 Anne's popular greeting cards at a reduced price, $4 each, when you order any other item from this site. Or, buy as a bundle of all available cards for $30! Anne's newest work.....see it here first! Find & Like Us on facebook.